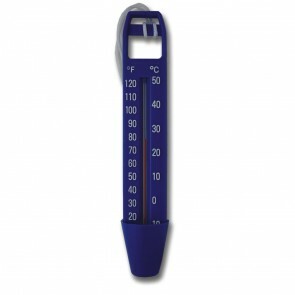 Thermometers and pH meters to ensure pools etc are within the correct operating ranges. Swimming pool thermometers can play an important roll in the safe and effective management of pools. Swimming pool and spa temperatures are important for a number of reasons. Whilst higher temperatures may often be preferred by pool users, it will also lead to the faster multiplication of micro-organisms which in turn will require more chemicals to keep the water safe. Higher water temperatures will also cause bathers to sweat which is likely to limit swimming and will again, create a greater need for disinfection. Over-heating of the pool can also cause condensation in the vicinity of the pool. Spa thermometers can be used to monitor pool water temperatures which will usually use around 30°C to 40°C. Spas incorporate hydrotherapy jet circulation often with air induction bubbles. They are found in a wide variety of premises from hotels and sport centres to private houses. The combination of aerated water and relatively high water temperatures can result in an increase in microbial growth and a consequent risk of infection. This can also place a high demand on the spa pool's disinfection and filtration systems. Because of their smaller size, spa pools have a much higher ratio of bathers to water volume compared to a swimming pool, so the amount of organic matter can be far higher. These conditions can allow pathogens such as Pseudomonas aeruginosa and Legionella species to mutiply quickly. Floating pool thermometers are ideal for checking the temperatures of water in pools, ponds and spas. Our range of pool thermometers include digital and spirit-filled options.